This cemetery has earned the distinction of most return visits by Gae and myself and more hours of research per capita (that just reads weird) than any other cemetery on these pages to date. This catalog also has the distinction of being the most complete and accurate one of New Lancaster Cemetery, if I may be allowed to brag. When two year old Michael Mitchell died January 10, 1845, it was planned to bury him at Hobbs Cemetery. 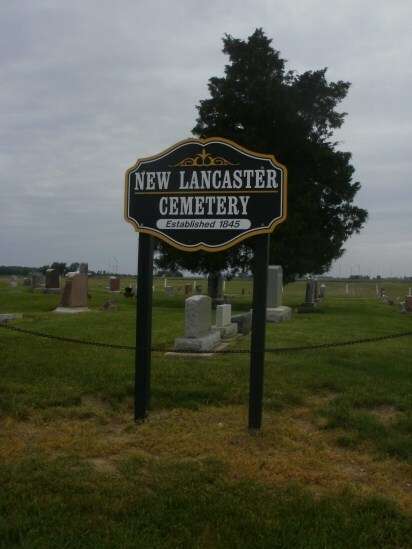 But, weather conditions became so bad that his father, Michael, and neighbor Samuel Townsend each gave one-half acre to establish this cemetery near New Lancaster. Later the Mitchell's sold their land surrounding the cemetery to William Cook and sometimes this cemetery is referred to as Cook Cemetery. Rows are numbered from west to east and stones north to south. The old section of this cemetery is very confusing and haphazard near the center. Our count of rows may differ from yours by plus or minus one. August 2015: I have a new friend, Holly. Yes, it's true, some people like me. Holly is a descendant of Catherine Raudebaugh and thanks to her, two members of the Raudebaugh family have been added to New Lancaster, George W. and his mother, Catherine. Thanks Holly for the great pictures of your kith and kin.